Nineteen Sixty-four: Do Catholic Schools Matter? The economics of schooling in many areas has become very difficult—especially in the Northeast and Midwest where many of the oldest schools are located (often in urban areas where few Catholic families reside today. For more on this: 1, 2). Whenever funding becomes tight people begin to make cost and benefit decisions. What are the benefits? There is certainly no shortage of research on how these schools perform academically. Results lean heavily toward comparatively positive outcomes but sometimes it is difficult to disentangle these from issues of student self-selection and school admission decisions. 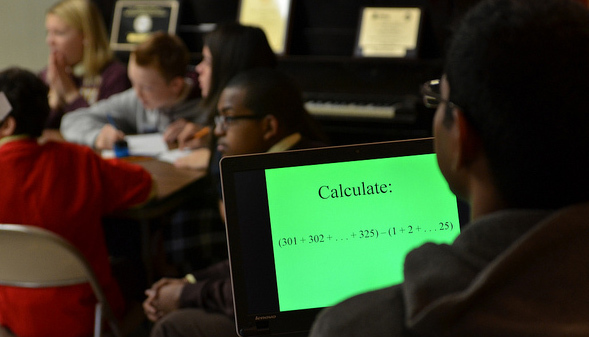 Regardless, few question the ability of Catholic schools to educate students academically. CARA surveys of parents reveal that the top reason parents chose to enroll children in Catholic schools is not for academics but for “quality religious education” followed by a “safe environment” (Primary Trends, Challenges, and Outlook: Catholic Elementary Schools Since 2000). “Quality academic instruction” ranks third for the reasons parents choose Catholic schools (...parents cite “tuition costs” as their biggest problem in enrolling their children followed by “insufficient tuition assistance”). Thus, if one is looking to measure “benefits” perhaps the top concern is in how well Catholic schools provide religious education and the eventual formation of knowledgeable and active Catholic adults. It would be easy to just compare all Catholics who went to a Catholic school to all those who had not in our national surveys of self-identified Catholics. 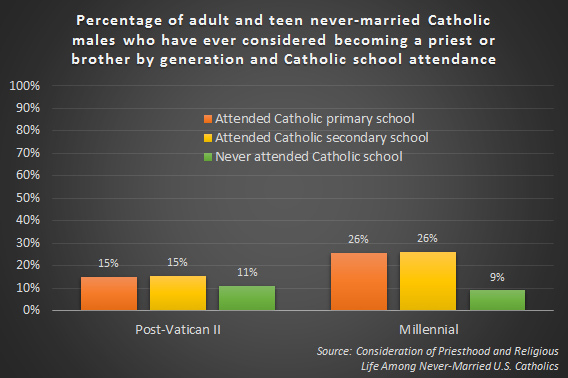 However, there are significant differences in the proportion of Catholics who attended these schools by generation. Also much has changed on these campuses. For example, schools used to be staffed mostly by religious women and men as well as clergy. Now the vast majority of school staffs are composed of lay women and men. 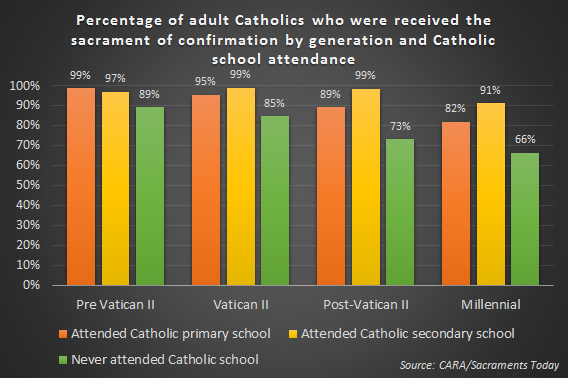 In CARA’s recent national surveys of the adult Catholic population (CARA Catholic Polls) a majority of those of the Pre-Vatican II Generation (born before 1943) and the Vatican II Generation (born 1943 to 1960) say they attended a Catholic primary school (51%). However, in the generations that followed many fewer report enrollment. Only 37% of Post-Vatican II Generation (born 1961 to 1981) Catholics and 23% of Millennial Generation (born 1982 or later) Catholics have attended a Catholic primary school at some point. Perhaps the most straightforward test is to examine the effect of Catholic schooling on Mass attendance. 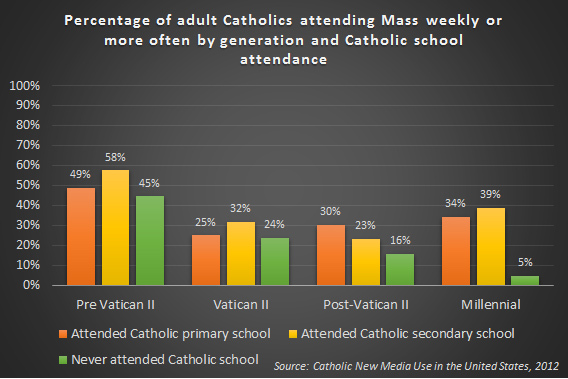 The figure below shows Mass attendance by generation and by previous enrollment in a Catholic school as a child (…note the schooling sub-groups are not mutually exclusive. One could have attended both a Catholic primary and secondary school). Generally, those who attended a Catholic school attend Mass more frequently than those who did not attend a Catholic school in each generation. However, differences become more pronounced (and statistically significant) among younger Catholics—those of the Post-Vatican II and Millennial generations. Most Millennials did not attend a Catholic school and few of those in this group attend Mass every week (5%). A third or more of those who did attend Catholic schools are weekly attenders. I’m sure the Church would wish attendance levels were even higher among young Catholic school alumni. At the same time, if Catholic schools disappeared the Church might expect future Mass attendance levels to be well below 10% outside of Christmas, Easter, and Ash Wednesday services. It is also the case that without schools the Church might also expect to have fewer Catholics in the United States overall. The number of confirmations celebrated in the United States has been in decline since 2009. Part of this decline is likely linked to current changes in Catholic schooling. As shown below, the likelihood that one has been confirmed is correlated with having attended a Catholic school. Among Millennials, only two-thirds of those who never attend a Catholic school are confirmed compared to 82% of those who attend a Catholic primary school and 91% of those who attend a Catholic high school. It is very likely that some Catholics who never attend a Catholic school leave the faith before or shortly after becoming adults. These losses are not captured in the figure above, which only includes those who continue to self-identify as Catholic as adults. A 2003 CARA Catholic Poll estimated that nearly eight in ten Americans raised Catholic who had attend Catholic schools (primary and/or secondary) self-identified as Catholics as an adult. By comparison fewer seven in ten of those raised Catholic who did not attend a Catholic school remained Catholic as adults (CARA has not replicated the sampling and series of questions needed to measure this by Catholic schooling since 2003. However, it is known that retention rates overall have fallen since that time). Another key area where Catholic schools have a strong impact is on vocations. As shown below, among never-married Millennial Generation male Catholics (ages 14 and older surveyed for CARA’s Consideration of Priesthood and Religious Life Among Never-Married U.S. Catholics) who have attended a Catholic school, more than one in four indicate that they have considered becoming a priest or brother. Only about one in ten of those who did not attend a Catholic educational institution indicate this. 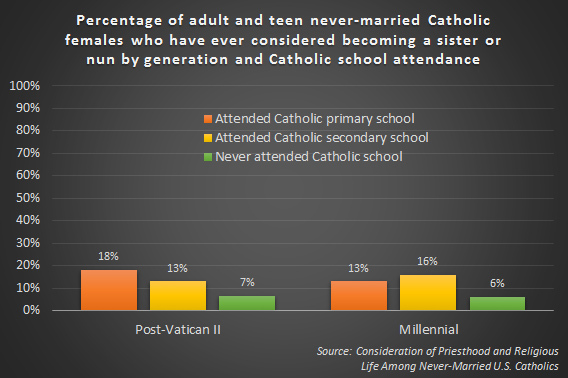 Also shown below, among never-married Post-Vatican II and Millennial Generation female Catholics (ages 14 and older) who have attended a Catholic school, 13% or more indicate that they have considered becoming a sister or nun. Only about 6% to 7% of those who did not attend a Catholic educational institution indicate this. If fewer and fewer Catholics enroll in Catholic schools in the future either because of changing preferences or a lack of schools it will become ever more challenging for the Catholic Church to foster vocations to the priesthood and religious life. The connection between Catholic schooling and interest in vocations is found to be robust and statistically significant even after controlling for a variety of other factors (e.g., enrollment in parish-based religious education, frequency of Mass attendance, race and ethnicity, income, other youth experiences). Catholic schools are part of a pipeline that provides a major source of vocations and ministers. As mentioned previously only 37% of Post-Vatican II Generation Catholics and 23% of Millennial Generation Catholics have attended a Catholic primary school at some point. 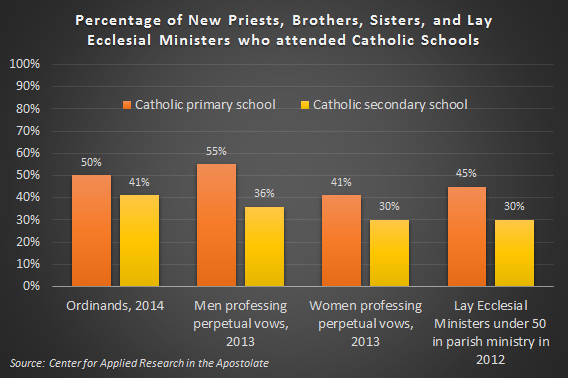 Yet, half or more new priests (50%) and brothers (55%) attended Catholic primary schools as did 41% of new sisters and 45% of younger lay ecclesial ministers. Without Catholic schools the next generation of Church leaders would be more difficult to recruit and form in the numbers that will be needed for a growing Catholic population (1, 2). 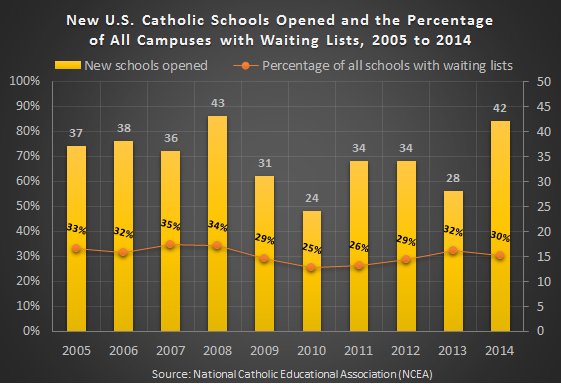 In the broadest view, the long-term benefits of Catholic schools in making Mass attendance more likely and helping ensure young Catholics are confirmed (and remain Catholic as adults), along with the importance these institutions play in fostering Catholic leaders likely outweigh many of the short-term financial difficulties Catholic schools currently face. The Catholic Church would be weakened significantly by continued losses of Catholic schools. At the same time there are many schools that are no longer financially feasible. There are simply too few Catholic families in some areas. These campuses should be closed (...unless they can remain open with non-Catholic students. Schools can educate and evangelize). What is essential is that the Church needs to build many new schools where Catholic families are. Where to start? There are 18 U.S. dioceses where the number of parish-connected Catholics (i.e., registered or attending Mass) per elementary school exceeds 25,000. Most of these are in the South or West. Using demographic planning (i.e., identifying areas with many Catholic families) the Catholic Church could successfully construct new Catholic schools in many of the dioceses listed above. In a national view, these new campuses would replace closing campuses in areas of the Midwest and Northeast and maintain the Church’s capacity to provide education for the shifting U.S. Catholic population. Some of this is already occurring. Since 2005, the Church has established 347 new schools. Also during this period about three in ten schools nationally have had waiting lists (1,986 schools in 2014). But 347 new campuses are insufficient to rebuild the capacity the Church needs in the South and West (...nationally more than 1,500 campuses have closed in the last decade). It is also the case that much of the growth in Catholic population in the South and West has been among those who self-identify their ethnicity as Hispanic. Only 14% of students in Catholic schools nationally are Hispanic while 45% of Catholics ages 18 to 29 self-identify as Hispanic. 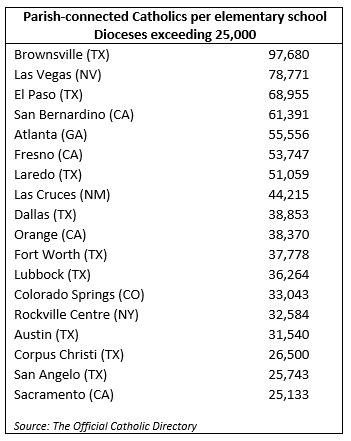 Some have wondered about the feasibility of new schools in the South and West if Hispanic parents do not choose to enroll children in sufficient numbers. The CARA survey of Catholic parents mentioned above also revealed that once one controls for income (and other factors such as age, frequency of Mass attendance, education, and availability of financial assistance), Hispanic parents are no more or less likely to enroll children in Catholic schools than Catholic parents of some other race and/or ethnicity. Thus, the current lack of enrollments by Hispanic Catholic parents does not appear to be an issue of cultural or school preferences. The shortfall is likely mostly economic with the median household income for Hispanic families in the United States only about 64% of what the average non-Hispanic white family earns annually. In 2013, the median Catholic elementary school tuition was $3,673 per year (after adjusting for inflation this is 37% higher than what it was in 2004). Many may be simply priced out of the possibility of enrollment (...and this in turn may be negatively impacting Hispanic Catholic retention and affiliation). So the challenge is even greater than just creating new schools. The church needs new and more affordable schools. As incredibly difficult as this may be, failing to rebuild a new model of Catholic schooling where it is needed most would likely result in Catholic retention rates falling to levels of many Protestant denominations (e.g., minorities of those raised Methodist, Episcopalian, or Presbyterian remain affiliated as such as adults). The Church would struggle to develop the next generation of leaders. Then again it would need fewer leaders because Mass attendance rates among a diminished Catholic population would result in fewer demands for sacraments and religious practice. If the Church is looking to get smaller in the future it could easily achieve this by continuing to reduce its capacity to provide school-based religious education. That was a long way of saying, yes, of course Catholic schools matter. Classroom image courtesy of Saint Francis Academy. Note: CARA Catholic Polls are conducted with GfK Custom Research’s nationally representative panel. A random sample of adult Catholics are surveyed from this panel through their computer or through a television-based interface (for those without computer and/or internet access). This reduces social desirability bias that occurs when surveys are conducted with human interviewers. It is well understood that respondents over-report their church attendance in telephone or face-to-face polling. This problem is minimized using the methods CARA employs in its national surveys.